Let’s be real for a sec…who doesn’t love donuts? If someone shows up with donuts, even the staunchest deniers secretly want to indulge in their sweet, soft tastiness. 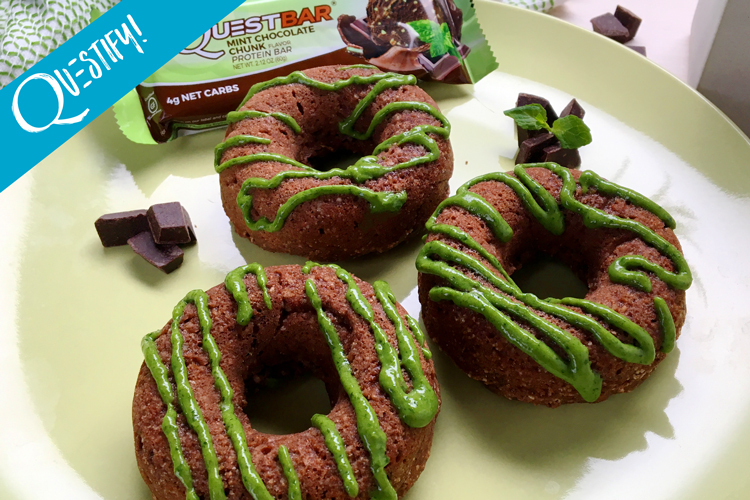 Lucky for you, these are Questified Donuts! Topped with a sweet minty and spinach (yes, you read that right) glaze, these poppable treats are perfect for the protein lover in your life. 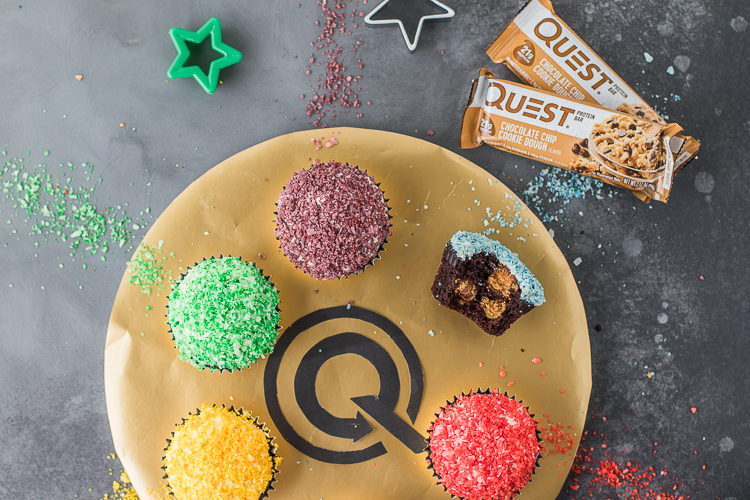 Break Quest Bars into small pieces and place onto a nonstick baking sheet. Bake for 3-4 minutes, Remove to cool. 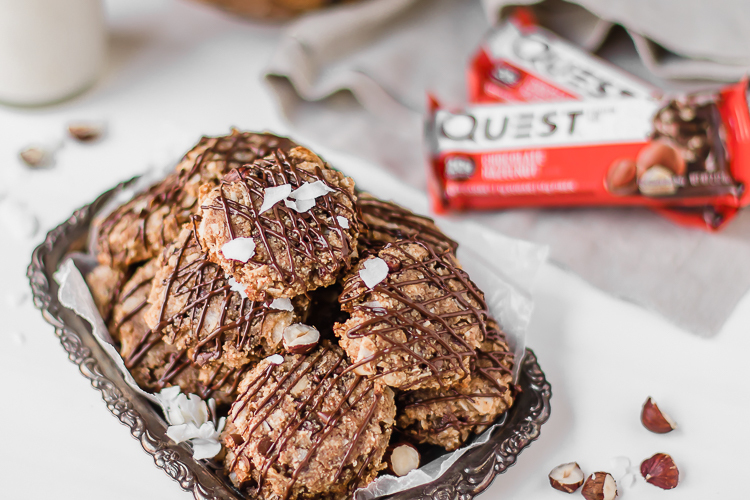 In a food processor, add baked Quest Bar pieces, Pulse until crumbs are achieved. Add quest bar pieces, sugar free sweetener, coconut oil, applesauce, eggs, vanilla, and salt to a medium bowl and stir until well combined. 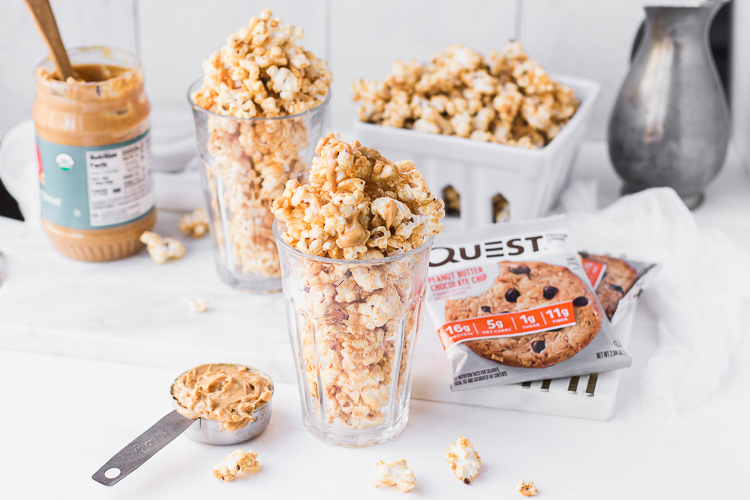 Add baking soda, almond milk, almond flour to the bowl, and quest milkshake protein powder slowly stir until well combined (batter should be thick like cookie dough) add a little more protein powder if necessary. Add batter to a piping bag or ziplock bag with an end cut off and pipe batter into a oil sprayed doughnut pan 2/3 of the way full. Bake doughnuts for 8-16 minutes, set aside to cool while you make the glaze. Add glaze ingredients to a food processor and pulse until smooth. Frost cooled doughnuts with glaze. Sprinkle doughnuts with chocolate and 1-2 whole mint leaves for garnish. Written by: Levi Harris on March 16, 2018.